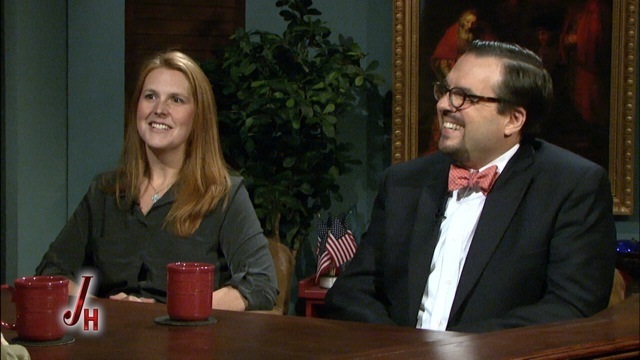 We are excited, and honored, to be scheduled to appear on The Journey Home at 8 ET, Monday, February 10, on EWTN. We watched A LOT of The Journey Home as we traveled our road to Rome, and it was a privilege to get to meet the incomparable Marcus Grodi and his dedicated Coming Home Network staff. If you’d like to watch and can’t catch the broadcast, it will be available on The Journey Home website here and YouTube here after it airs. This entry was posted in Conversion, Jason, Nikki and tagged EWTN, The Journey Home. Bookmark the permalink. So exciting! I saw y’all on the schedule and was looking forward to seeing you “live”. I saw you are going to be on, too! Have you already taped? No not yet: March 10th is the taping date. Say a prayer for me please! We will most definitely pray for you. Just a tip- taping is unrehearsed and straight through- no stopping, so be prepared! (but not too prepared) Because of that, there are a couple of things I wish I could have redone, but oh well. You are going to do great! If you stay with the Scholten’s you will have a wonderful time. They are stellar people. Looking forward to watching the broadcast. The Journey Home is the BEST show on TV. It’s the reason I pay the satellite bill. It has helped so many Protestants and lukewarm Catholics make the journey to the Sacraments. I’ll be watching! Jason and Nikki — WELCOME HOME!!! This is some of the most exciting news I’ve heard! Are you guys in the VA area? We’re back near our alma mater and would love to catch up. I can’t wait to watch the program and hear your story! May God bless you abundantly! Thanks, Meredith! We’re still up near DC. Do you ever make it up here? If not, we’re down in Chesapeake every so often and maybe could meet down there sometime. We’d love to catch up as well! Thanks so much, Bernie and Heide! Fr. Horkan was our RCIA instructor, and he was at the house last night. Our whole family just loves him. Blessings to you!! I watched your Journey Home episode. My first reaction is that I am not smart enough to be a Catholic, because I cannot follow much of the theology that led to your conversion. I also have many questions, particularly on how Catholicism gives you the truth more clearly. I found two points most interesting. First, that you have a more personal relationship with Jesus Christ by experiencing the sacraments. That makes a lot of intuitive sense to me, particularly with respect to confession. Second, I would like to learn more about how the church gave us the Bible. This also makes a lot of sense to me, but what can I read to understand this concept? Thanks for watching, Danny! Your comment prompts a few thoughts. First, Nik and I were trying to cover a lot of ground in a short period of time and probably short-handed a few things that would benefit from a longer explanation. If there’s anything either of us said that was confusing, we’d be happy to clarify. I’m actually convinced that Catholic doctrine, at heart, is more straightforward and simple than the Protestant doctrine that conflicts with it. At the heart of Catholic doctrine is the teaching that Christ, out of His abundant love and mercy for us, left us with a visible Church with authority: (1) to tell us definitively what Christian teaching on faith and morals is (and, when necessary, what it is not); and (2) to administer sacraments that impart His grace (i.e., His divine life) to His children here on Earth to help them reach Heaven. In contrast to that, all Protestant groups (whether they’re Anglican, Presbyterian, Baptist, Methodist, etc.) place the ultimate responsibility for determining true teaching on the individual believer and (by and large) deny the existence of sacraments that convey grace to the individual Christian. On the question of the canon of Scripture that you raise, the main point for me is that, if we don’t recognize the authority of a visible Church to settle disputed questions when necessary (like what books should be in the Bible), we can have no confidence that the books that are in our Bibles are the ones (and only ones) that should be there. As a Protestant, this became a big problem for me, since most Protestants assert that “Scripture alone” is the final authority for determining what is and isn’t true Christian doctrine regarding faith and morals. But if we can’t even be sure that the books we have in our Bibles are the right ones, how can the Bible be any kind of an authority (let alone the “final” one)? It’s simply a fact that the Church (as a visible, functioning body) predates the writing of a single word of the New Testament. So the Church did not need the Bible in order to exist. And, over the course of the first several hundred years of Church history, the Church debated which writings should comprise the Christian New Testament. This history is discussed here. One of the books that some Christians believed was canonical was the Didache. You can read the Didache here. At least for me, it’s not obvious (just by reading it) why the Didache isn’t Scripture, but the book of Jude is. This history, at least to me, shows that the Protestant position on the canon doesn’t stand up to scrutiny. As I understand it, the primary Protestant argument for why a visible Church with authority isn’t necessary to define the canon is that it is “obvious” (just by reading them) that the books that are in the Bible are the ones that should be there—out of all the books ever written in the history of man. This position, however, makes it possible for any individual Christian to pick up the Shepherd of Hermas (another book some early Christians considered canonical) even now and assert that, in his or her opinion, it’s “obvious” that the Shepherd of Hermas should be in our Bibles—and that everyone who disagrees with them is “obviously” wrong. This position also makes it possible for the Mormons to contend that the Book of Mormon is “another” testament of Jesus Christ because, if the canon was never closed by a visible Church with authority, there’s nothing to say that it’s not still open. The Protestant position on the canon also allows individual Christians to challenge the presence of certain books. Indeed, Martin Luther attempted to remove four books from the New Testament that he didn’t like: Hebrews, James, Jude, and Revelation. See here. On this question of canon, Protestants also often will argue that the books in the Bible are there by broad consensus in the early Church regarding which books should be there and why. But there was a fair amount of agreement in the early Church (although it wasn’t unanimous) that what Protestants call the Apocrypha should be included in the Old Testament. Protestants don’t have a problem rejecting that consensus, though. For more on the canon of the Old Testament, see here. For a Protestant view of the canon of the Old Testament, see here. I find the Protestant view unpersuasive because it relies simply on the fact that the Roman Catholic Church did not authoritatively define the canon of the Old Testament, for the universal Church, until the Council of Trent in the 16th Century. That argument, however, misses the point. The Church tries to define dogmatically as little as possible—and it wasn’t until the Protestant Reformation that the need arose to finally (and dogmatically) settle the canon issue. There are a few more on-line resources I recommend on this question of the canon here, here, and here. If you’d like some recommendations of books to read that address the subject, I’m happy to send you some. Finally, I am convinced that Catholicism gives the individual believer a surer foundation of Truth. For example, the Catholic need never worry again about whether the doctrine of the Trinity as articulated in the Nicene Creed is sound or not—because that Creed was articulated by a Church Council with authority to settle the doctrinal disputes it was addressing. But, in the Protestant world, I can recall a number of conversations about whether we should even use the word “Trinity,” since that word doesn’t appear in the Bible. On a more personal level, the same is true of the issue of artificial contraception, which Nikki and I discussed during our interview. Protestants are all over the map on that question, using the “Scripture alone” approach, and it’s practically impossible for an individual Protestant to feel that he or she has reached the right conclusion on the question.